240 Coil Count, 9 1/2" 1 Sided Euro Top. The Corsicana Arabella Broyton Euro Top Twin mattress set is special compared to other Euro Top mattresses. It was designed with budget in mind and is firmer than its counterparts. The Broyton Euro Top Twin mattress scored a Comfort Scale rating of 3. It offers a smooth quilt top -- meaning there is less space separating you from the comfortable materials. 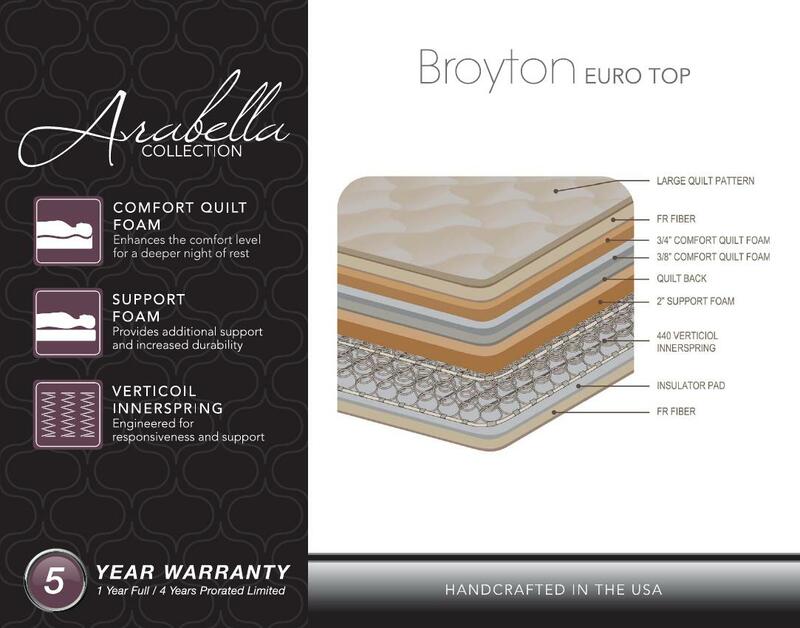 Featured in the Corsicana Arabella Broyton Euro Top Twin mattress set is the Elite Verticoil Innerspring System. This is a tied system, where any coil that has pressure applied to it transfers some of that pressure to adjacent coils. The Elite Verticoil Innerspring System does not offer much motion transfer reduction, although it does lend itself to being more durable. Two layers of high-grade polyurethane quilt foam are used in the Broyton Euro Top Twin mattress. This offers significant pressure relief and is notably used in most other mattresses made today. There is an additional two-inch layer of support foam which creates the dense feeling that this mattress provides, as represented in the Comfort Scale rating.